This is a very quick and rewarding project, sure to please. A few hours of bead stringing, an hour or two of knitting and Voila! A wonderful bracelet, or anklet, swirling with two sides in a delicate and delightful design, is born. All you need is one spool of the thread of your choice (we prefer the Tapestry Braid or Fine Braid, both high quality polyester metallic threads from Krienik), two different colors of 8/0 beads and a simple clasp. Colors close in value -- that would be two colors close to each other on the color wheel, like blue and green, or red and orange. Cool colors -- would be any of the colors we normally think of a cool -- greens, blues, purples, some deeper reds, and the like. Warm colors -- would include yellows, oranges, and other colors with a touch of sunshine to them. Strongly contrasting colors -- would be two colors that stand opposite each other. An example might be dark blue and bright yellow. Any of the complementary colors would be strong contrasts as well. We realize that these are very very general categories, but we find it so difficult to list all the possibilities. Feel free to come up with whatever color combinations appeal to you. If we can find beads to match your ideas, we will do it in a heartbeat. 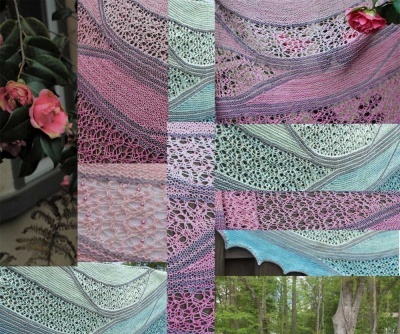 And bear in mind that the thread color will show through some beads, particularly transparent ones and crystals, and can create a whole new color as well. 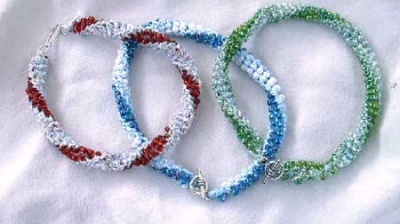 In fact, the red and the green bracelets photographed here were both done using Crystal AB beads for the lighter colors. There are many other combinations which look great. Click on the photo to the right to see one combination with 4x4 cubes plus 8/0 beads -- the bracelet-in-progress is starting to swirl on the right. Combining different size and shapes gives a very interesting look. If you are interested in mixing two different shapes of beads, we have that option listed here as well. Oh! And if do you want to tell us specific colors to use, just tell us using the "Comments" section as you check out -- that works well.